A technique for automating the creation of animated, animal avatars to represent individuals in the virtual world is being developed by two Texas A&M Department of Visualization professors with the help of $500,000 grant from the National Science Foundation. Tim McLaughlin, head of the department, is conducting the three-year study with co-principal investigator Ann McNamara, assistant professor of visualization. “Our intention,” McLaughlin said, “is to enable avatar users to represent themselves in ways that combine ‘look’ and ‘motion’ to communicate more effectively. A study of China's disaster recovery management model, as exhibited in its response to the 2008 Wenchuan earthquake, is under way at the Texas A&M College of Architecture. Yu Xiao, assistant professor of urban planning at Texas A&M, is principal investigator for the two-year research project funded by a $102,715 National Science Foundation grant. The research will use China's recovery management model to advance theoretical understanding of the process of post-disaster recovery management and develop a management framework for coordinating agencies within a three-tiered governmental structure in addressing recovery challenges of catastrophic disasters. A research project providing an estimate of Galveston's post-Hurricane Ike population conducted last spring by students in Texas A&M's Master of Urban Planning program has won a Student Award from the Texas Chapter of the American Planning Association. The students’ research results prompted a Daily News editorial, as well as public dialogue about Galveston's future and how its population decline should be addressed, said Shannon Van Zandt, director of Texas A&M's Master of Urban Planning program. A Texas A&M landscape architecture professor is looking for technologies to help transportation agencies meet new federal guidelines restricting the content of stormwater runoff from road construction sites. The three-year, $736,293 study funded by the Texas Department of Transportation, pairs Ming-Han Li, associate professor of landscape architecture, with researchers from the Texas A&M University System's Texas Transportation Institute, the University of Texas and Texas Tech University. Georgina Davis, a Ph.D. student in architecture at Texas A&M, has returned to McMurdo Station in Antarctica to continue her research on occupant comfort and energy efficient buildings in extremely cold climates. 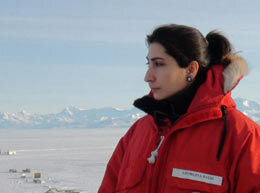 "Studying facilities such as McMurdo Station is important because, as places devoted to long-term scientific studies in a variety of scientific fields, these research stations need to run efficiently and effectively under extreme conditions, while also accommodating the health and comfort of the scientists and support personnel," she said. 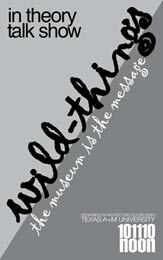 "Wild-Things," a new "In Theory" Talk Show moderated by Peter Lang, associate professor of Architecture at Texas A&M University, will shine a spotlight on the pervasiveness of museums in modern culture. Playing off the notion that "the museum is the message" — a spin on “the medium is the message” phrase coined by communications theorist Marshall McLuhan — Lang’s distinguished guests will examine the extent to which a museum embeds itself in the message and influences how the message is perceived. Joining the informal discussion, set for noon - 1 p.m. Monday, Oct. 11 in the Langford Architecture Center's Wright Gallery, are James Dart, principal of New York-base0d DArchitects; Antonio La Pastina, associate professor of communications at Texas A&M and an expert on media studies, intercultural communications and ethnic and gender identity; Joshua Bienko, assistant professor of visualization and multimedia artist; and Deborah Cowman, director of the Brazos Valley Museum of Natural History and assistant research scientist at the Institute for Science, Technology, & Public Policy. Highlighting the discussion will be a screening of Bienko’s new music videos honoring contemporary artists TehChing Hsieh and LeWitt, Sol. The work was recently selected as a finalist in an international creative video contest co-sponsored by the Guggenheim Museum. See related story. Lucasfilm presentation: Representatives from Lucasfilm will talk about the company at a special presentation for students enrolled in Texas A&M's graduate and undergraduate visualization programs. Lucasfilm is one of the world's leading film and entertainment companies. Founded by George Lucas in 1971, it is a privately held, fully integrated entertainment company. In addition to motion picture and television production, the company's global businesses include visual effects, sound, video games, licensing and online activity. 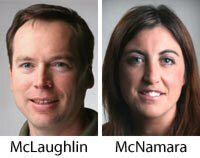 The presentation is scheduled for 7 p.m. in Langford C105. Additional details will be provided when available. Pixar presentation: Representatives from Pixar Animation Studios will make a special presentation tailored for Texas A&M visualization students 7 p.m. Thursday, Nov. 18 in Langford C105. Pixar is an Academy Award-winning computer animation studio with the technical, creative and production capabilities to create a new generation of animated feature films, merchandise and other related products. Pixar's objective is to combine proprietary technology and world-class creative talent to develop computer-animated feature films with memorable characters and heartwarming stories that appeal to audiences of all ages. Additional details on the Pixar visit will be posted when they become available. The 36th Annual Aggie Workshop, a two-day conference organized and hosted by the Texas A&M student chapter of the American Society of Landscape Architects, will bridge the gap between students and professionals. The event, held throughout the Langford Architecture Center, features luminary speakers, design charrettes and roundtable discussions with industry professionals. For additional information, contact Thena Morris at t-morris@tamu.edu. Aggieland Saturday, the campus-wide open house for prospective Texas A&M students will include activities and events hosted by the College of Architecture. Prospective freshmen and transfer students, and their families, are invited to attend. The event is free. 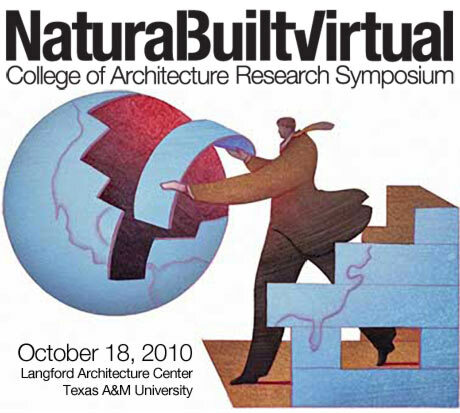 For details, contact Ann Eastwood at aeastwood@arch.tamu.edu. Historic Preservation Symposium: The annual Historic Preservation Symposium hosted by the Center for Heritage Conservation at the Texas A&M College of Architecture is set for Friday and Saturday, Feb. 25-26 in the Preston Geren Auditorium. Details will soon be available on the CHC website. Rachel Hadfield tries out a boat students built in a summer Structures 1 class led by John Nichols, associate professor of construction science. "The class is about timber," said Nichols. "Building the boat was a way to learn about watertight timber structures." 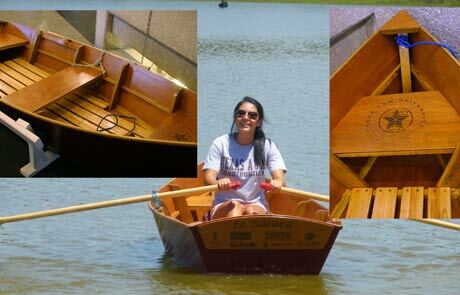 After building the boat in the College of Architecture's woodshop, students took it to a small lake at the Riverside campus. 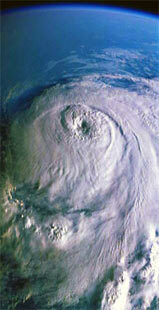 "It floated with no leaks, no problems," said Nichols. This semester, students in the class are building a 16-foot Maine lobster boat and are looking to test it in Austin's Town Lake Nov. 19.